Sea Keep is a fortress in northwest Summerset. It is situated east of Lillandril, along the southern coast of the northern peninsula. It has been infiltrated by the Storm Sharks, who slaughtered those within the garrison and conjured a storm around it. Sea Keep previously appeared in Arena. 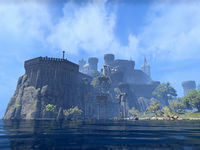 During the alpha state of Summerset, the "underwater passage" was originally called "ruined passage", and the keep was inhabited by the Sea Vipers rather than the Storm Sharks.